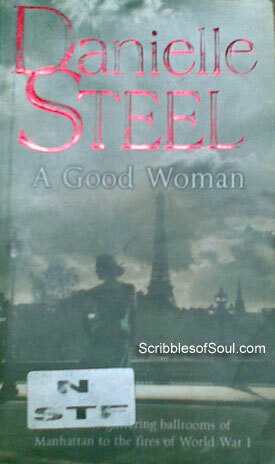 ‘A Good Woman’ by Danielle Steel begins as the life story of a rich young girl, Annabelle Worthington, who is born into an aristocratic family, has an abundance of grace and beauty and at the tender age of eighteen, makes her debut, ready to be wooed by charming young men, with her vivacity and innocence. As I began reading, I was overwhelmed by the sweet mushy romantic tone of the novel, and expected a humdrum love story, where a beautiful, rich girl falls in love with a poor yet dashing dude. A staple rom-com of Victorian era full of Ball-room humor and clandestine affairs! But, Danielle proved me totally wrong. I was hardly prepared for the rude shock, Annabelle Worthington was about to receive. Contrary to all my expectations, the sugary sentimental story took a sudden tragic turn. The unlucky day of 14 April 1912 toppled the ordinary life of Anna into an extraordinary tale. The newspaper announced that Titanic, the mighty ship has sunk on her maiden journey. The shocking tragedy meant a grievous personal loss for the nineteen year old girl, who is left alone, to cope with the sudden catastrophe, as her parents and brother were on the fateful vessel, and had probably left for their heavenly abode a bit too early! Titanic may have just been a ship, but the moment it drowned, it became a metaphor for fragility of life. Thousands of people lost their lives, leaving behind another few thousand to mourn and grieve. Whenever a mass destruction occurs, we are deeply shocked with uncertainties of life and the bizarre stubbornness of death. But, seldom do we take out a moment to consider the fate of those, whom the victims have left behind. Their dependents – children, wives and parents, who are suddenly plunged into a deep abyss of grief and helplessness, trying to gain balance after the mighty fall. And, it was heart warming to read a story, which revolves around this eerie aspect of life and death. The juxtaposition of merry, luxurious life of Annabelle with the sudden tragic twist jolted me and all my sympathy swayed towards the unfortunate girl, who was left alone in the first rushes of youth. Daniel Steel’s impersonal, neutral narrative had won me over. Though, little did I know that she would keep on recreating this unique tragic melodrama quotient in the novel, each time impressing me a little more and the book would become one of my eternal favorites. Annabelle’s character grew in an enchanting way. She is no ordinary rich girl. Unlike her best friend, she is more interested in pursuing a career, preferably becoming a doctor, than getting married. And, in a stroke of good luck, she indeed gets married to an understanding man, who is sensitive enough to let her follow her heart. Anna in the middle of the novel, appears to be in seventh heaven, happily married and madly in love with her husband. And, it appeared as if nothing would ever go wrong in her life. But, Danielle here introduced another twist, as her married life fell to pieces, and she had to leave America to escape scandal. One event led to another, and the unsure girl of initial pages was transformed into a mature, single mother, who is ready to face the world with confidence. And, in true triumph of good heart over destiny’s bad influence, Annabelle comes on the top, justifying the title and premise of the novel. I really liked Danielle’s mingling of historical facts with fiction. Be it the fall of the Titanic or the cruelties of First World War, the author never failed to highlight the humane side of the story, drawing the readers into the little known lives of people of the early 20th century. The gaiety of ball-room contrasted sharply with the gloominess of make shift hospitals on the border of France, and yet Anna was always in control of the situation. Steel has created quite a strong character, in a way a symbol of emancipation of women, at a time, when women could hardly think beyond marriage and children. Though, I did find the constant goodness and meekness of Annabelle a bit too frustrating. She bore repeated assaults on her person too lamely- be it her husband’s treachery, Count’s physical abuse or Antoine’s betrayal, the lack of active resistance was a bit surprising, in a woman, who was bold enough to work amidst cannons! But, still I liked the novel, as much for the exaggerated portrayal of joyous, easy life of rich, who tried to protect their honor in society, while suffering marital discord, as well as for the true portrayal of a single mother, who is hopelessly in love with the child of a man who raped and abused her, highlighting at the same time woes of excessive child birth and the possibility of alternate sexuality breaking a heart. Despite minor glitches, quite an engaging novel!